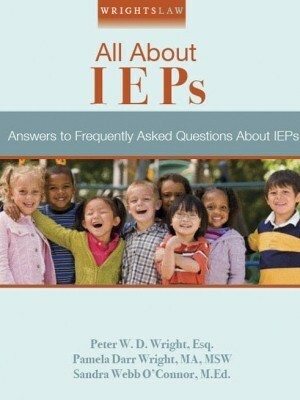 My child has an IEP. She has chronic health problems documented by three medical specialists and she has a Health Plan. Chronic health problems and medical appointments forced her to miss many school days this year. She made up all her work and has no incomplete assignments. Her grades are A’s and B’s. The school told her that if she doesn’t make up the time she missed, she will not get credit for these classes. Can they do that? She would gladly give up her sick days for school days. The purpose of laws that require children to attend a certain number of school days is to deter truancy. A law that is intended to deter truancy must include exemptions for children who have chronic illnesses or who are injured, not truant. Your child passed her classes with flying colors but the school is threatening to withhold credit for these classes because she was ill and unable to attend school. 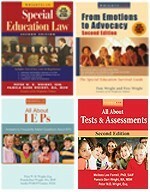 Public schools are required by law to accommodate the health needs of students. The plan to accommodate health needs may be called a health plan or a 504 plan. Your child has a health plan but the school is not following it. Call your State Department of Education. (You will find contact information for your state in the Directory of State Education Departments) Ask about your state’s attendance requirements and exemptions for children who have documented illnesses and health plans. Please let us know what you learn. I spoke with the state department of education about the school’s punishment of my child for truancy when she has a chronic illness. Because the chronic health issues are noted in her IEP, and because her IEP states she will need special accommodations, her absences are excused. The representative thought our district is just not familiar with the laws that protect students with chronic illnesses. Thanks for letting us know that you were able to resolve this problem. In our opinion, the school should give your daughter an award for courage and perseverance, despite the obstacles she faced. For readers who have sick children, the American Diabetes Association has prepared excellent model 504 plans and health plans. 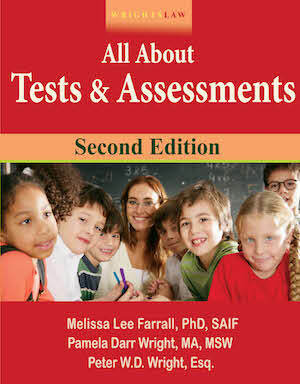 These model plans can be modified to cover other health or medical problems that affect a child’s school performance. Download the model plan and revise it so it describes your child’s medical condition and needs related to that condition. Consult with your child’s doctor to make sure the plan is complete and covers all your child’s health needs. 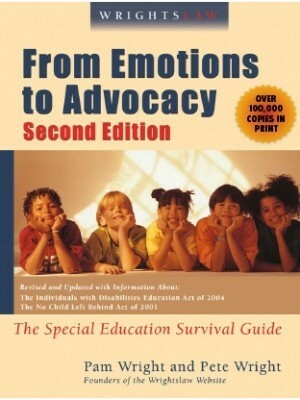 To learn more about helping children with chronic illnesses, read My Child Has Health Problems, the School Reports Him Truant by Suzanne Whitney. Sue writes about creative advocacy strategies in Doing Your Homework. 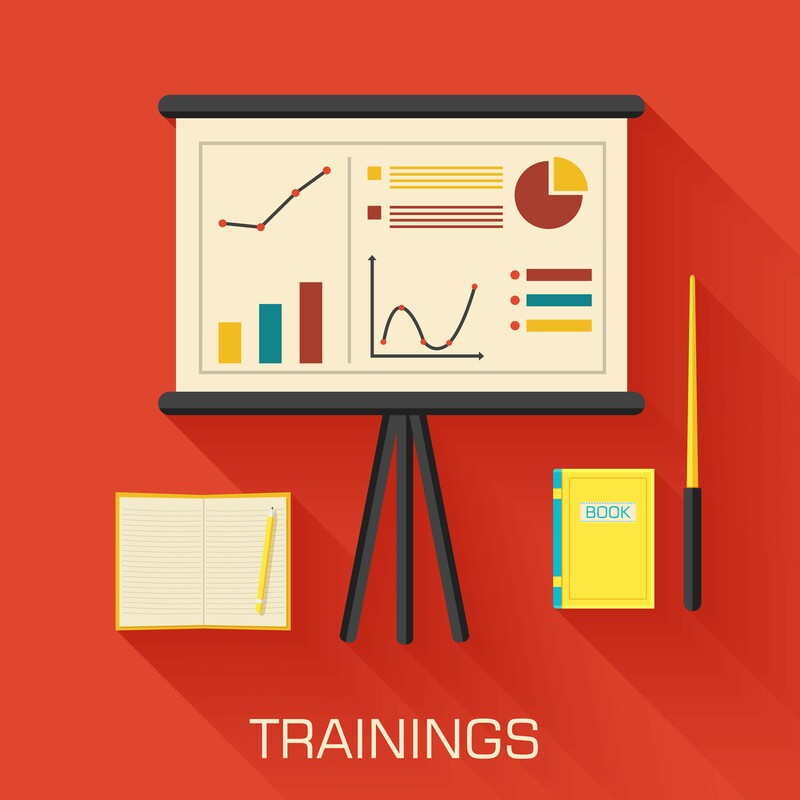 Review the legal and advocacy information and resources from the American Diabetes Society. This information is useful in advocating for children with other health problems. 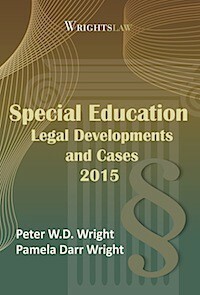 This entry was posted in Accommodations & Modifications, Advocacy, Discrimination / Section 504 / ADAA, FAPE, Health & Medical Issues, IEPs, Parent Rights & Responsibilities, Section 504 and tagged 504 plans, chronic illness, diabetes, Discrimination, health plans, truancy by Pam Wright. Bookmark the permalink. I think that this issue even goes into higher education facilities as well. Most City Colleges have instituted an absentee policy that students can miss no more than TWO classes in a semester and this includes student with disabilities. This violates everything and they were sued for it years ago but found a work around and changed it to participation but now its coming back as absentee. I have students who I work with who get solid A’s on their exams sometimes a B, do all the homework do everything including extra credit but then the instructor fails them or withdraws them due to absences even if its a chronic medical condition. hello, my son has missed 18 days of school for being sick. we found out that he’s lactose and we are now treating the condition. NJ law you can only be out of school 20 days. he has kept up his grades and even made the honor roll. but the school is calling me in to discuss. I’m scared they will require him to repeat the grade. I cant find anything on the internet about being excused from school for medical reasons is there such a thing? I’m also worried what if he gets sick with something else we only have 2 days to spare and 3 months left of school.. 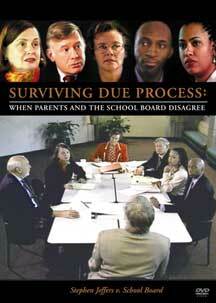 Many states have policies on excused absences. Try googling excused school absences in NJ for health reasons. Does my son have an rights or is there any laws to dropping a course late in the school year if he suffers from depression, in the state of Illinois? He’s a senior and the only way out of a course that is thoroughly stressing him out beyond a normal range is to take a withdrawal/Fail? Is there any legal rights that would grant him a Withdrawal (W) on his transcripts?? 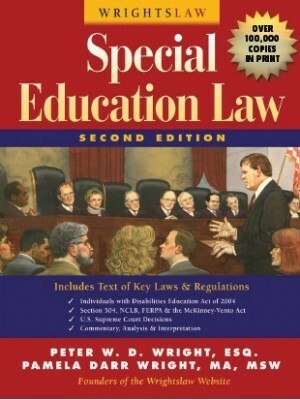 Kelly, each state has laws and regulations governing special education & education. State laws can be different from federal law In some areas. Federal law does not address issues like dropping a class. If this is addressed anywhere, it would be in your state law/regulations. 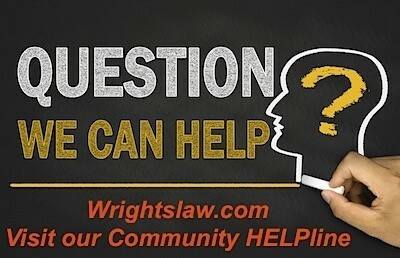 We can’t answer your question about whether your son has any legal rights, except in general terms. If your son has an IEP or 504 plan, he may have protections, especially if the IEP or 504 plan provides for accommodations and/or modifications that address his depression. If he has an IEP or 504 Plan, is the school providing the accommodations and/or modifications listed? 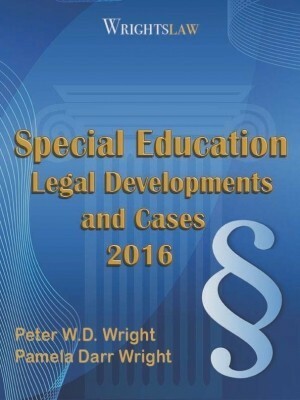 I strongly urge you to request a consultation with an Illinois attorney who specializes in education / special education law. In most places, consultations are not very expensive but will provide you with accurate info about legal righs in your state and how to proceed. 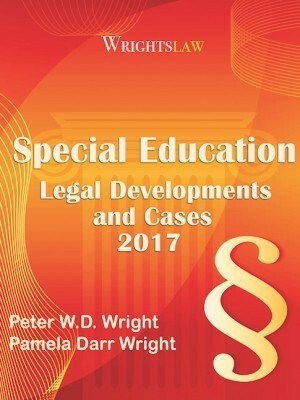 We built the Wrightslaw Yellow Pages for Kids with Disabilities site that has listings for attorneys, advocates, evaluators, tutors, etc for each state – Go to https://www.yellowpagesforkids.com and click your state. The Council of Parent Advocates and Attorneys (COPAA) has listings of their members. Info about their directory is here. Hi child services are trying to take away my children due to frequent absences from school. My 14 yr old suffers chronic migraines causing her absences. She’s been hospitalized 2xs and in and out of the er alot. I also have an autistic 9 yr old that hates going to school and flat out refuses alot we have been working with school and child services and a social worker to get him to attend. We are also getting him wrap a round service to try to help. The schools report the absences and now cys is taking us to court to remove my kids. How can they get away with this when both kids have a disability? Wraparound should help to educate the other community agencies, as well as Children’s Services about your family’s situation. It should help with both children, even if it is specifically convened for your son. Just be sure to cooperate and take advantage of any of the services they offer. You also need to find out if your son is being bullied. If you know other kids in his class or their parents, ask them…they always know what’s really going on in class, on the bus, in the lunchroom etc. My child has missed 40 or more days of school because of chronic illness she been seen by several specialties had scoliosis surgery 3 years ago and after has been serving from unexplained abdominal pain every 3 weeks which keeps her out of school at times also suffered from eczema/allergies she’s always catch colds more often and can keep her at home too. I always notify the school what’s going on with her with doctor’s notes. So recently the school social worker call DCF on me now twice I explained show prove but it seems they don’t care just wants my daughter in school. Of course I want my daughter in school please help I’m at my wit’s end what can I do? Do I have parents rights and my child? Need advice. Not sure what you mean by “attendance accommodation statement. If I do decide to homeschool my sister would she still be allowed to go to the career center for extra schooling for health science? Legally they probably could, but it would depend on state, & district policy, & procedures. i am a 14 year old high student and i have been getting very sick over the past 2 weeks. my mom works from 8am to 6pm and she has no time to take me to the doctors. i have a iep and health issues including PTSD ADHD asthma and more.my mom is upset because if she does not work she can’t pay rent and we don’t know anyone here really 2 help us and I just moved from NY.i missed 1 day of school but my mom is afraid to let me stay home and rest. I just barely get out of my bed and I keep waking her up with my coughs. if I miss more days of school she can get a fined. I don’t want that and she can’t play rent and a fine. please help if u have advice. If he is served by special education, or Section 504, you can contact the district coordinator/director for that program.